barry's buds bid farewell to the year of the potato. (mis)adventures we’ve had with barry over the past year. it would be a huge understatement to point out that we have a thing for potatoes. we’re obsessed. this past year was particularly gratifying, as our appreciation of this sacrosanct little spud was made to seem slightly less crazy by the u.n.’s decision to dub 2008 the international year of the potato. yes, really. in the familiar, fluffy pabulum of betty crocker, thinly sliced and meticulously arranged on a pizza at famoso’s, piped atop a moist meatloaf cupcake in a beetroot-tinted pink swirl, shredded in pancakes, roasted with sea salt and dill, diced in hash brown casseroles, cubed in coconut milk curries, mashed with cream cheese and herbs, encased in perogie dough, swimming in dill cream...and that's not even mentioning all the french fries. as part of our bidding a proper farewell, here are two simple recipes that we each enjoyed this year. 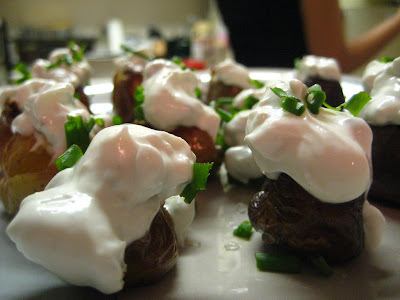 recipe one: mini baked potatoes with blue cheese. *note from barry’s bud #1: this potato recipe has been extracted from me under great duress. because i cannot bear the threat of the wire whisk any longer, i offer you this to appease barry. 2. wash and dry your potatoes. 3. toss you potatoes with just enough oil to coat. 4. lightly coat you potatoes in sea salt. 5. spread your potatoes out on a baking sheet. 6. bake potatoes for 45-50 minutes. 7. while potatoes are baking, combine sour cream and blue cheese in a small bowl - measurements are just a guideline. 8. take potatoes out of oven and let cool for a few minutes. 9. cut an 'x' in the top of each potato - gently squeeze the cross with your fingers to open the potatoes. 10. top each potato with a spoon of the blue/cheese sour scream mixture. 11. garnish with chopped chives. adapted from: forster, felicity, ed. "mini baked potatoes with blue cheese" in soups. (london: hermes house, 2004: p. 240). recipe two: balsamic caramelized potatoes. *note from bud #2: i made up this pretty simple recipe after a visit to the old strathcona farmer’s market where i picked up a bottle of maple balsamic vinegar. parboiling the potatoes before roasting is a bit indulgent, but i feel they warrant this attention. 1. combine olive oil, balsamic vinegar, garlic power and thyme in a bowl. set aside. 3. add potatoes to a pot of rapidly boiling salted water. 4. boil potatoes just until they're soft and you can easily stick a fork through (about 5-7 minutes). 7. bake at 400F for 30min or until potatoes are browned. barry's restaurant review: urban diner. in an effort to save money, i’m trying to eat out only twice a month. as you can imagine, this is very hard for me since i love food. love. so, i try to make the outings count…and it’s such bitter disappointment when they don’t. take saturday’s outing to urban diner. i’ve never been before, but had heard ridiculously fantastic things about their brunch, so three buds and i decided to head over and see what all the fuss was about. it’s a cute place with lots of booths and tables, and though there was a line to get in, we didn’t wait long, and while we were waiting we had a fantastic view of pies. mmm…pies. we also had a great server who was very helpful, and a menu of gourmet breakfast dishes to choose from. the traditional eggs benny was a hit (great hollandaise sauce), as was the salmon and swiss quiche. the breakfast burger however…well, two of us ordered it, only one of us actually liked it, and it wasn’t me. you’d think a sandwich that had five (five!) proteins in it (ham, bacon, meatloaf, fried egg and cheddar cheese) would be heavenly. you would be wrong though. it was salty, the meatloaf was a funky texture (too soft) and was bland, and there was a red pepper spread. about the red pepper spread: you know when there’s a food you don’t like, olives for example, and there is the smallest portion of it in a dish you’re eating? all you taste is olives! well i normally like red peppers, but all i could taste was salt, bad meatloaf and olives. and by olives i mean red peppers. bad red peppers. it was so disheartening i had to get pie. i’m the kind of person who needs things to end on a positive note, like pie. damn good pie. between the four of us we ordered three desserts to share: banoffee pie, sour cream lemon pie and white chocolate orange-mint cheesecake. they sent our taste buds into sugar overdrive, and tried to erase memories of a bad breakfast from my mind. they didn’t succeed, but they did try, and i have to give them credit for that. the eggs benny, and more importantly the hollandaise, was good. the food was pricey; not a big deal if your meal tastes great, but it’s salt added to the wound if you’re not digging the food. there’s going to be a line to get in. you’ll just have to accept this fact if you’re heading there on a saturday morning after 9:30.
barry’s almost finished with christmas. really. yes, yes – it’s mid-january and i’m still talking about christmas food, but really, these are dishes that can be enjoyed all year long but only need to amalgamate into one meal once a year, and besides, january is so boring now. no parties, no celebrations of rebirths, no shiny things to distract you from the mundane, and spring is WAY too far away – what’s a person to do? reminisce about the holidays, that’s what. so here i am, offering up the joy of christmas once again for those die-hards who just won’t go down. as mentioned in my previous bit, i had twelve dishes laid out for christmas, and yes, the bread was the most ridiculous. today i want to talk about the other, equally tasty, but far less ridiculous dishes of the evening. so, because i know you’re curious and that you care, the twelve dishes are as follows: kutia (boiled wheat with honey), borscht, kolach, sweet and sour cabbage rolls, potato-cottage cheese and sauerkraut perogies, beet salad, pidpenky (creamy mushroom sauce), mashed beans, salad (we felt that something remotely healthy was needed), and raisin perogies for dessert. phew! lots of stuff, yes, but it all created a beautiful symphony of smells and flavours. from these classics i want to share a few of my favourite year-round recipes with you. they’re cheap, tasty, and i don’t know what else. just try them. 1. cover beets with water and boil until soft (nobody likes a crunchy beet, people); canned beets will take less time. drain. 2. sauté onions in mazola until translucent. add oil and onions to drained beets. 3. add vinegar and sugar to beets along with salt pepper and garlic powder. mix and refrigerate. **the longer you refrigerate this salad, the better the flavour. delicious on their own, or used like a spread in place of hummus. 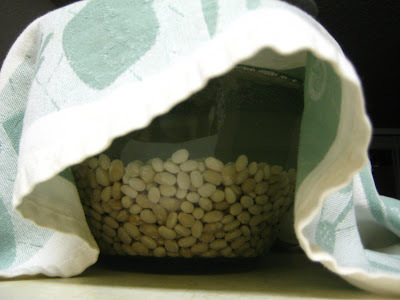 1. in a bowl, cover beans with water and soak overnight. 2. drain beans and put in pot covered with water. cook on low for approximately 3 hours. beans should be soft, and there should not be much liquid left. 3. sauté onions in oil. as beans can be dry, you want to have oil in the pan, if you don’t think you’ll have enough, feel free to add more. grate garlic into the pan and sauté for the last two minutes of cooking. 4. without draining, mash beans. add oil, onions and salt. feel free to add more salt or oil for taste. finally, what the masses have been waiting for…and by masses, i mean one of barry’s buds. 1. sauté onion in some oil until translucent. at the end of cooking (last 2-3 minutes) grate in the garlic. 2. in a separate pan, cook mushrooms in butter and worcestershire on high. you want to cook out all the liquid from the mushrooms. stir often so the mushrooms don’t burn. 3. add onions, garlic, cream and salt to the mushrooms, mixing the onions and cream separately in a bowl, then adding them so the cream doesn’t separate. and by some, i mean a lot. yes, last week was ukrainian christmas, so a shindig was in order to celebrate the occasion, and, of course, a proper shindig requires food. deciding to do a traditional ukrainian christmas eve dinner, i set out to think of which twelve dishes to have. i made it to eleven before getting stuck. i thought that i could attempt fish jello or pickled herring, but the jello boat has sailed for the next month or so since new year’s was jello-filled, and i just refused to have pickled herring in my apartment. 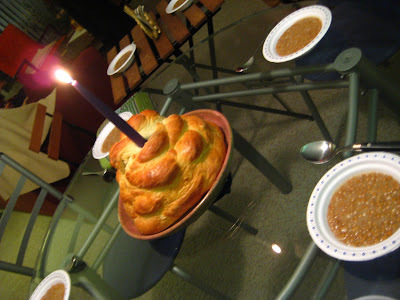 then it hit me: kolach! yes, traditional christmas bread would be perfect and meaningful in getting my guests in the true meatless/dairy-less spirit of things. i’ve never even thought of attempting such a feat before, so i found a recipe, looked up online how to braid the stuff, and set to work. i started at 6:30 pm after a quick bite to eat, knowing that i’d probably be up until midnight baking, but no worries because one of barry’s buds came by to visit and photograph THE EVENT. so i left the yeast to do it’s thing, then added the first of many, many cups of flour, and then let it continue to do its thing. okay, first step complete (finally). the camembert my bud brought is now gone, and the smell of yeast has begun to overwhelm us. we now mix the rest of the many, many cups of flour with the mixture along with some eggs and oil. my arm began to go numb around 9:30, but it’s okay, this is an art! 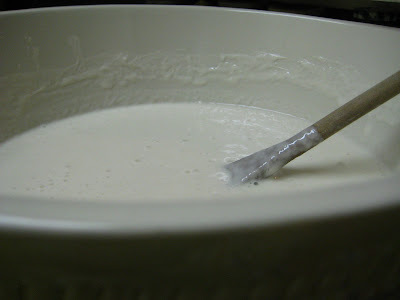 soon after i throw the spoon away and start going at the mixture with my hands. i make sure everything is mixed and then try to nurse my arm back to health with a drink or two. 11:00 pm. okay, no problem, it’s time for the inaugural punching down of the dough. i feel that this is payback for my arm during the mixing portion of this misadventure and take great delight in doing a little damage to my dough. we’re feeling a little light-headed from the yeast. part of that might have been from the vino, but really, it was from the yeast. let it rise again. okay, so we’re past my midnight deadline. no problem. we take the frustration out on the bread. i feel that our punches are a bit weaker than they once were. we may have finally been overwhelmed. we retreat to the living room to recover from the yeast. “the blob” has risen. as i try to make it look less blobby with the help of a steak knife, my cohort brushes the thing with a nice egg wash. into my tiny, apartment-sized oven with it. we now start to work on the rest of the dough and braid breadsticks for each of my dinner guests. while the blob bakes, the breadsticks rise. oh god – it’s 2:45 in the morning… the blob emerges, and has been transformed from a beast into a thing of beauty that smells delicious. we tap the bottom, which makes a hollow sound. it’s ready. tray one of breadsticks goes in after being brushed with whisked egg. tray one comes out, and tray two goes in. barry’s bud bails. they made a valiant effort, but we have been baking since 6:30 pm. tray two is out, and so am i. my eyeballs hurt, and i’m drunk with the smell of fresh bread (and again, possibly wine). so was this craziness worth it? hell yes. fantastic bread, hilarious conversation, camembert, and a group of admiring dinner guests the next night – it was so worth it. the bread was actually easy to make, just time consuming as you waited for things to rise. this is the perfect thing to make to impress company if you’re hanging around home working on other projects. or maybe i’m just a masochist. either way, fun times with carbs are always something to write about. 1. dissolve 1 tsp. sugar in 1 c. lukewarm water and sprinkle yeast over it. let stand for 15 minutes. 2. combine yeast with 4 c. lukewarm water. add 4 c. flour and beat hard until smooth. cover and set aside in a warm place for 1 to 1 ½ hours until sponge is light and bubbly. 3. in a separate bowl beat eggs, add sugar and salt and beat slightly. add oil and beaten eggs to sponge mixture. 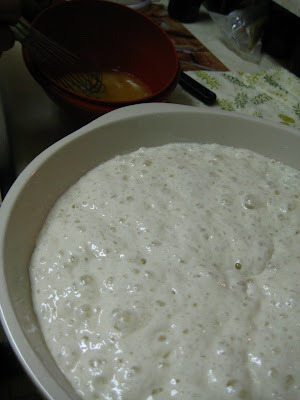 4. work in flour 1 c. at a time to make a fairly stiff dough. knead well. cover and put in warm place to rise until double in bulk. 5. punch down and let rise again. 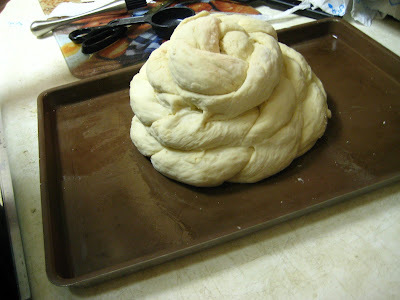 6. divide dough in proportion and braid. 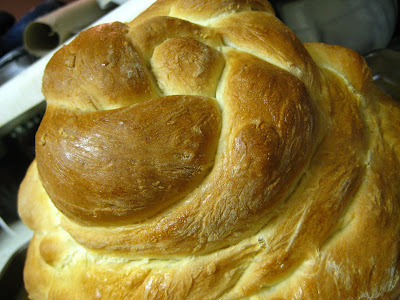 7. let braided dough rise then brush with 1 egg beaten. 8. place a rack in the lower third of the oven. 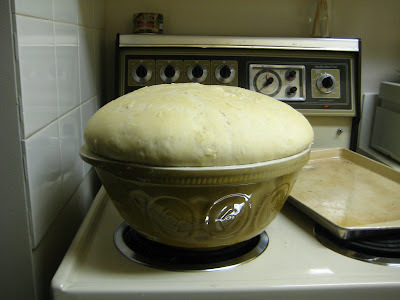 preheat the oven to 350 F.
9. put dough in oven for approximately 45 minutes. bread will be done if when the bottom is tapped it makes a hollow sound. barry thinks it’s cold outside, so go eat some soup! my parents can attest that growing up i was a very unimaginative child to take out to restaurants. lasagna, caesar salad and french onion soup were my only options of choice, and though i’ve branched out in my eating habits as i got older (thank god), i’ve still retained a fondness for my nostalgic three. 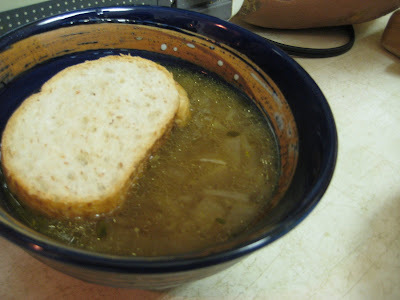 so, in saying that, this horrible weather has inspired me to warm up with some homemade onion soup and i’d like to pass along my recipe to you. if you want to get really crazy, caramelize the onions for a few hours ahead of time (you can do them the day before). don’t worry if you’re on some fangled new year’s health regime, just keep telling yourself that this is part of a healthy liquid diet. right…. 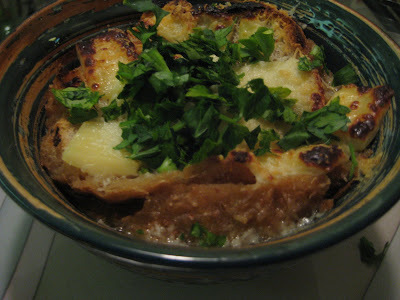 barry’s random french onion soup. 1. sauté onions in olive oil and butter over low heat. add sugar a teaspoon at a time throughout the process, as well as a smidgeon of salt and pepper. once your onions have just started to caramelize, add approx 1 ½ cloves worth of minced garlic. about halfway through the sauté add ¾ of the thyme. by the end of it, your onions should be golden yellow, almost creamy-looking and the smell in your kitchen should make you crave hot dogs. 2. to the onions, add your stock, wine, sherry and worcestershire sauce and bring to a boil. add your bay leaf and the last bit of thyme. reduce heat, cover and simmer for roughly 20 minutes. add salt and pepper to taste and remove bay leaf and thyme sprigs. 3. meanwhile slice french bread and rub with the remaining garlic. broil until toasted. 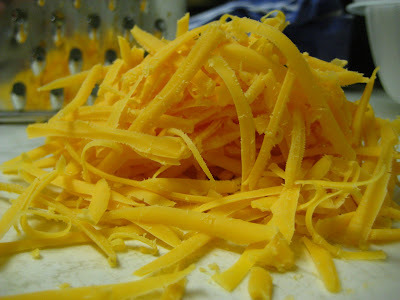 grate cheese. 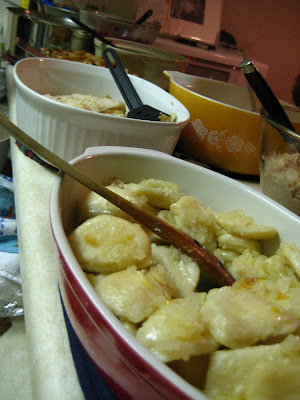 4. ladle soup into oven-proof bowls and top with bread then cheese. broil until cheese melts and starts to brown. barry says hello to 2009 with a look back at 1959.
happy new year to all! 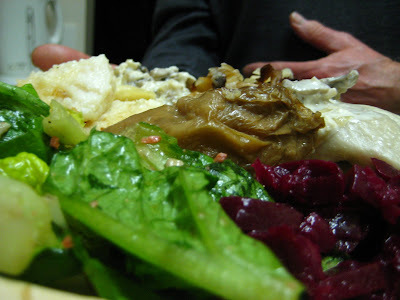 i had a delightful new year’s eve celebration – old friends, new friends, champagne and jelled salad. no, you heard me correctly: jelled salad. since time immemorial my mother has made a gelatinous concoction of lemon jello, crushed pineapple and shredded cheddar cheese for us to wolf (slurp?) down for christmas dinner, and every year we patiently wait for christmas to come again so that we can have our festive treat, and every year i conveniently forget to mention this particular dish amongst the litany of others i mention to friends. until this year. not surprisingly, when i mentioned the salad to friends, it was met with a bit of incredulity, amusement and flat-out fear when i indicated it would be my contribution to the list of new year’s eve culinary delights. so there it sat on new year's eve, jiggling slightly, surrounded by the other more favourable appetizers, whether in fear or in anticipation of midnight when it would ring in 2009 with a glass of bubbly. i’m happy to report that everyone there tried it, and i think that about 85/90% of the party-goers actually enjoyed the concoction. here’s to a new year of trying new things. 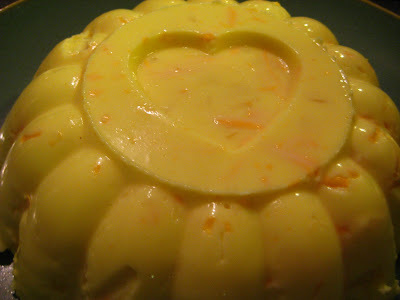 barry’s mom’s pineapple-cheddar jelled salad. 1. dissolve jello into hot water. add salt and lemon juice. 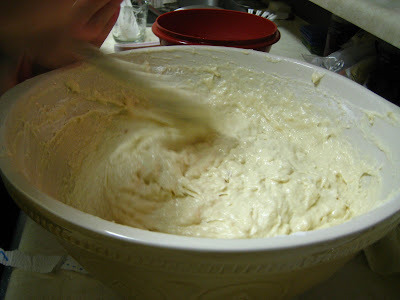 2. with electric mixer, beat in softened cream cheese until mixture is smooth. add pineapple juice. 3. chill until slightly thickened. 4. fold in pineapple and cheese. spread/pour into mould. chill until firm.